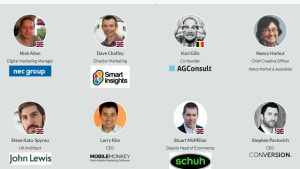 Digital Growth Unleashed Conference 2018 in London is part of the Data Driven Business series of digital marketing & social media events around the whole world. Digital Growth Unleashed Conference 2018 is focusing on how to attract the right audience, align business models with the user experience, optimize the lifetime value of client relationships and introduce you to the right technology to make it all happen. It is a two-day event, that introduces several sessions and workshops with Actionable Content, that takes place from 17-18 of October 2018 in London, the UK. Optimizing campaigns and channels to attract the right audience. How to create the most compelling customer experiences. Learn How to attract the right audience. Explore How to create the most compelling customer experiences. Meet the best digital marketing industry’s leaders. Unlock the full potential of your online business. Identify How to Meet the needs of your clients and prospects more fully. Follow up for Digital Growth Unleashed conference 2018 updates here OR discover more Digital Marketing events, conferences & webinars in the UK during 2018 here.